So as some of you know, I often solo and multibox raids, and Legendary Shroud is no exception. However, in order to do that, I have come up with some alternative strategies for some sections. In this thread, I will be going over Phase 1, the Portals. I find that this method works great, and can be useful with full groups as well (especially if the party composition isn't optimized). In my experience, this order minimizes the amount of time you will be at risk of Portal Keepers spawning and messing you up. The Portals spawn enemies in 3 waves. The first wave is a small group of Troglodytes. If any one of them is still alive by the time the second wave is set to arrive, it will spawn wave 2 enemies (a bearded devil, an orthon, or sometimes a Bezekira). If no enemies from that portal are alive when it's time for another wave, it will be wave 1 enemies again (troglodytes). If by the time the next wave is set to arrive and any wave 2 enemies are still alive, it will be a Portal Keeper with some body guards (Orthons). If the portal keeper stays alive for long enough, the raid instantly and automatically fails. The waves come at regular intervals and the duration it takes for auto-failure once a PK is up is always the same (insert time here once I take the time to time it). 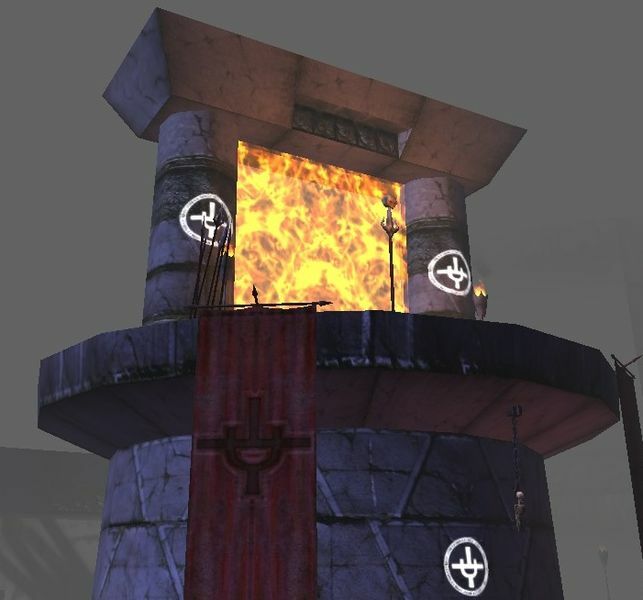 Also, when a PK arrives, the pillar where the first portal spawns has a gate at the top of it, the opening of which will light on fire when a PK is on the field. The portals spawn in a specific way. First wave of portals is just one portal. Second wave is 2 portals. The thirds wave of portals appears only once both those previous portals are destroyed, and 3 portals pop up at once. Once those 3 are destroyed, the fourth wave of portals appear, consisting of 3 more portals. Now the moment any one portal is destroyed, a new one appears to take it's place. Each portal from the 4th wave will spawn another portal (always in the same place depending on which portal in wave 4 was destroyed), and those new portals each spawn yet another portal once destroyed, totaling 15 portals to be destroyed. If your party is optimized, you will have one or two people focusing on the trash (usually insta-kill wizards) so that PKs never have a chance to spawn and everyone else can simply focus on destroying the portals (at which point the order is mostly irrelevant). However, this is not always possible. Either due to group composition, or simply being extremely shortmanned (or even solo), you will want an order that will minimize the time you have to divert attention away from the portals to kill PKs, and also be able to know exactly where they are if/when they do spawn. This order will minimize the amount of time you will have 3 portals open at once. Thus, once you get past the first hump, the phase becomes increasingly easier and easier. Normal orders keep 3 portals active until the very end. This order removes having 3 open at once ASAP so that you get to only worrying about 2 at once, then only 1 at a time, sooner. 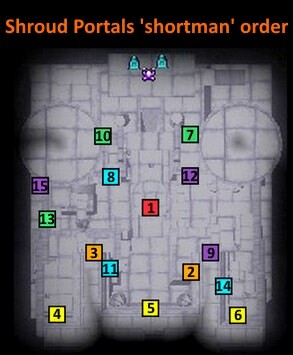 Furthermore, you will always have a better idea of where PKs are if they spawn in (they will always come in from the same one or two portals the entire time - portals below marked green 10 and green 13 - until they can no longer come in at all when you're down to one portal to fight at a time). Note that the green portals all spawn at the same time. However, destroying green 7 will always cause blue 8 to spawn, and destroying blue 8 will always cause purple 9 to spawn. Likewise, destroying green 10 will always cause blue 11 to spawn, and destroying blue 11 will always cause purple 12 to spawn. etc. There are - of course - variations on this order. They key is to pick one portal in the 4rth wave of portals, and stick to the new portals that spawn from that one until there are non left, then go to a second 4th wave portal and do the same, then casually take out the final 3.